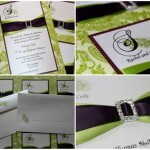 We offer custom designed invitations, addressed coordinating envelopes, RSVP cards (addressed), detail maps, menus, seating charts, place cards, table numbers, reservation cards, save-the-date, bridal shower invitations, rehearsal dinner invitations, personalized thank you notes, candy bar labels, favor tags and any other item you may need to complete your wedding stationery. 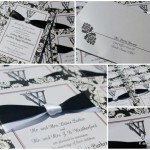 We also offer custom monogramming to coordinate with your stationery. We have ring bearer pillows, banners, flags, ribbons for invitations, personalized chair sashes, table runners and so much more. We also offer custom bags, personalized attire for bride, groom and attendants as well as attendant gifts. 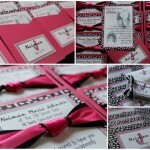 See our monogramming & personalization page as well as our facebook page for more ideas. Please click on the picture you like to see more and don’t forget to visit our portfolio page and keep reading for more details! Our designs are very unique and personal to each bride. 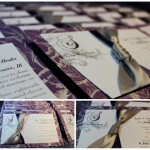 We work with each couple to create a custom design for their special day. We work from concept through completion to create an event that is unique for your special day. Your first consultation should take place 7-8 months prior to the wedding. You may e-mail or call for a free consultation. 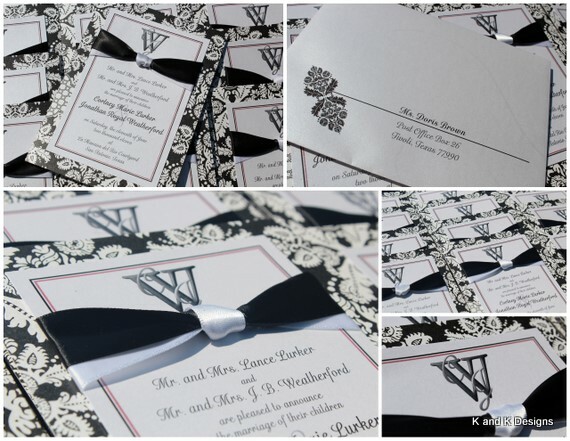 During your consultation, we will look at samples, paper choices, colors, embellishments and we will discuss your vision for your wedding stationery. To reserve your date, and begin the design process, a non-refundable $100 deposit is required.. This fee will be applied toward the purchase of your wedding stationery. The next step is for us to design items for you to preview. We will meet with you 3-4 months before your wedding to approve the design. Once a design concept is selected, a detailed proposal will be submitted containing a production timeline, pricing, details of your project and a payment plan that works best for each of us. We look forward to working with you! We are very happy to answer any questions that you may have about any of our services. We also look forward to your ideas in making this your special day. 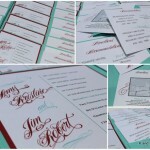 We are not just limited to wedding invitations. 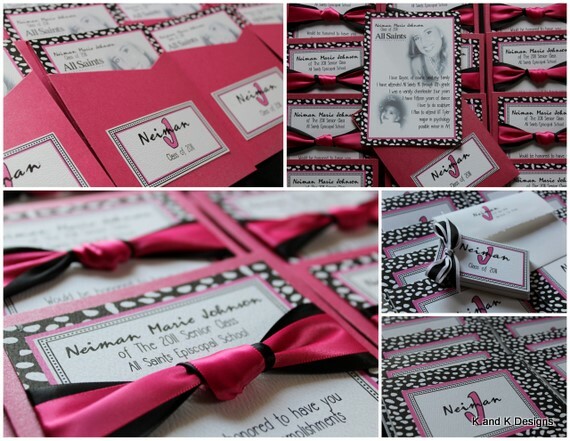 We can create birthday party, shower, graduation or any other type of invite as well as custom holiday cards. Please click on the picture you like to see more and don’t forget to visit our portfolio page for even more! 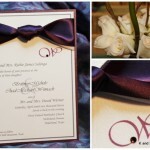 I would like to get pricing on invitations, our wedding in on January 7, 2012. My phone number is (409) 338-4569, Thank you and have a great day. It was good talking to you today Maria. Look forward to hearing from you on Wednesday. Whoa, whoa, get out the way with that good ifrnomatoin.